Berry Icebox Cake is in the house! Weather warming up means cold dessert time in our house. I absolutely love making refrigerator desserts because they are so easy to whip up, taste out of this world amazing, and use simple ingredients that we normally already have on hand. Our Very Berry Icebox Cake is no different. We’ve made other icebox cakes before, like our Banana Cream Dessert and our Smores Icebox Cake. 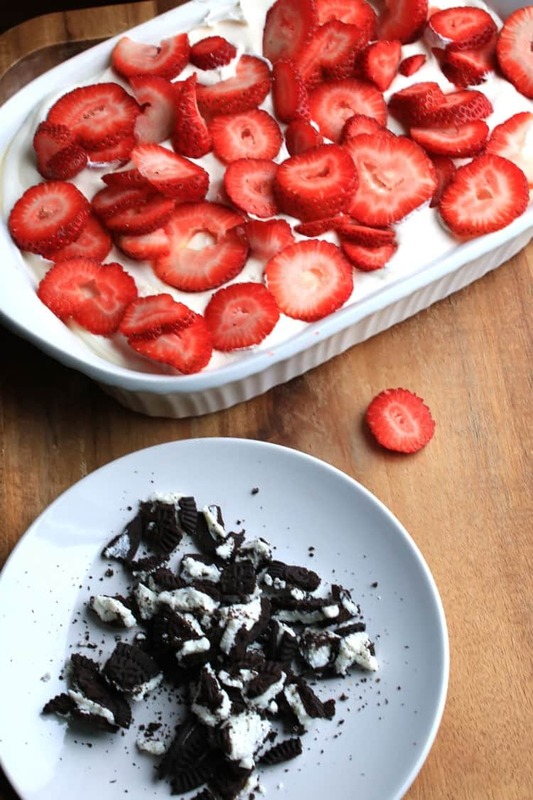 Both were delicious…but this is a lightened up icebox cake that is so much easier on my waistline. If you haven’t noticed, we like sharing what we’re cooking up in the kitchen on our Instagram feed as well. Because then we can go back and look at it when we want to drool some more. Right? I’m using the term icebox cake loosely for this recipe, because really what we’re talking about is a layered dessert. It’s layer upon layer of silky perfection–flavor that you’ll seriously want to nibble at. Tiny little bites are the way to eat this dessert creation, because savoring the sweetness is exactly what you want to do. We made the Very Berry Icebox Cake a lightened up recipe for a reason. We should all be able to enjoy a nice portion of a dessert without all the guilt. 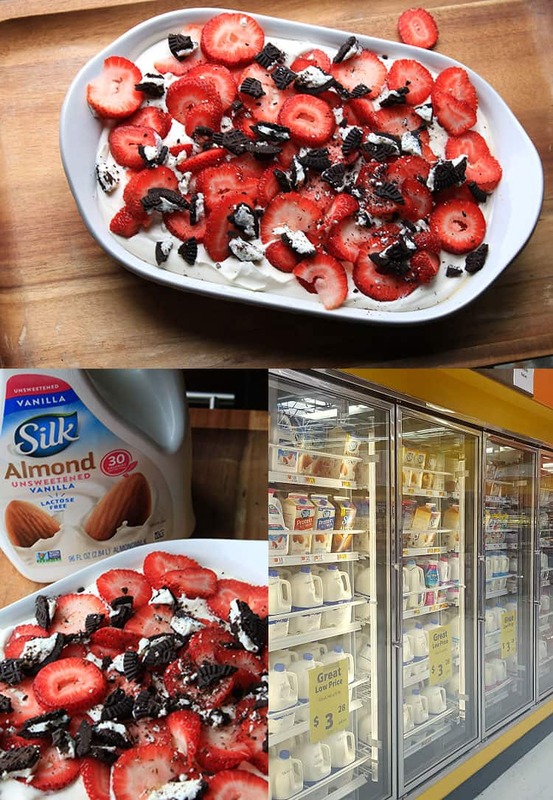 The key ingredient we used to whip up our icebox cake is Silk Almondmilk 96oz Unsweetened Original, which we picked up on our last trip to Walmart. You could opt for the Silk Almondmilk 96oz Unsweetened Vanilla variety instead if you’d like. It would add a little extra flavor to the dessert and be phenomenal, but I asked the family their preference for this recipe, and we all agreed that the unsweetened Silk Almondmilk would do the trick. Making healthier dessert recipes doesn’t have to mean leaving out all the sweetness. For this recipe, we used reduced fat (gluten-free also!) chocolate sandwich cookies, fat free whipped topping and sugar free cheesecake pudding mix–all that in addition to a few cups of Almondmilk 96oz Unsweetened Original, which is just 30 calories per serving. 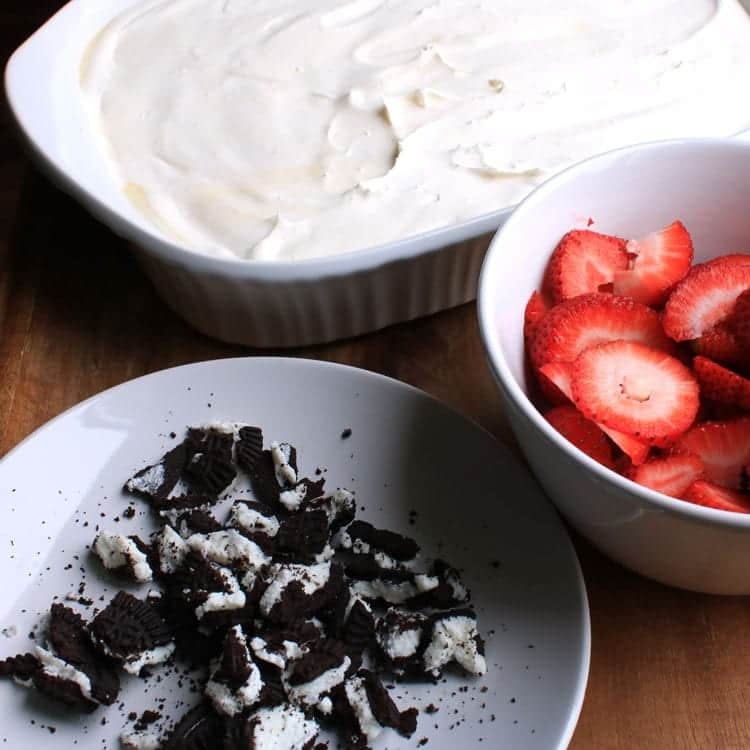 Add in a couple cups of sliced strawberries and you have a healthier for you icebox cake recipe that is sweet, low calorie and just plain delicious. One of the things I look for in all ingredients I buy these days (now that our daughter is on a gluten-free diet) is that the product is gluten free. In addition to being gluten-free, Almondmilk 96oz Unsweetened Original and Vanilla are both free of dairy, soy, lactose, casein, egg and MSG.This is AWESOME, because do you know how many people struggle to find products that are free of those ingredients so they can safely consume them? I knew, but never truly grasped the challenge until our daughter had to go on a gluten-free diet. This is one of the simplest recipes you will every make. True fact. Line a casserole dish with low-fat chocolate sandwich cookies. Just one layer…this means that each serving will get about 2 cookies, depending on how big of servings you offer. Mix together 3 cups of Silk Almondmilk 96oz Unsweetened Original with 2 packages of sugar free cheesecake pudding mix. Mix until slightly thickened. Pour half of the pudding mixture over the cookies. Combine whipped topping (we used dairy free) with the other half of the pudding mixture. Fold the whipped topping in with a spatula and then pour this over the top of the cookies and pudding and spread it all out. 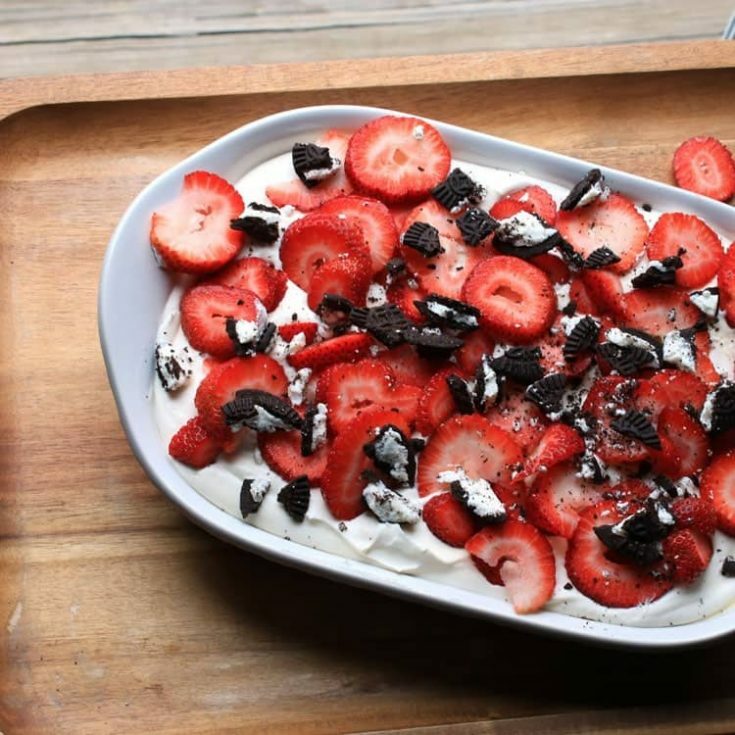 Top with two cups of sliced strawberries. 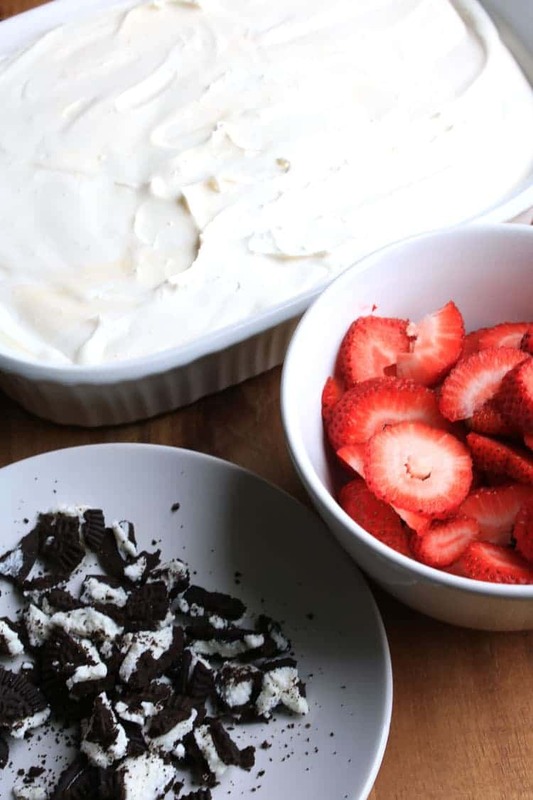 Sprinkle crushed chocolate sandwich cookies over the top of the strawberries. Really, it would be difficult to NOT enjoy this delightful lightened up dessert. 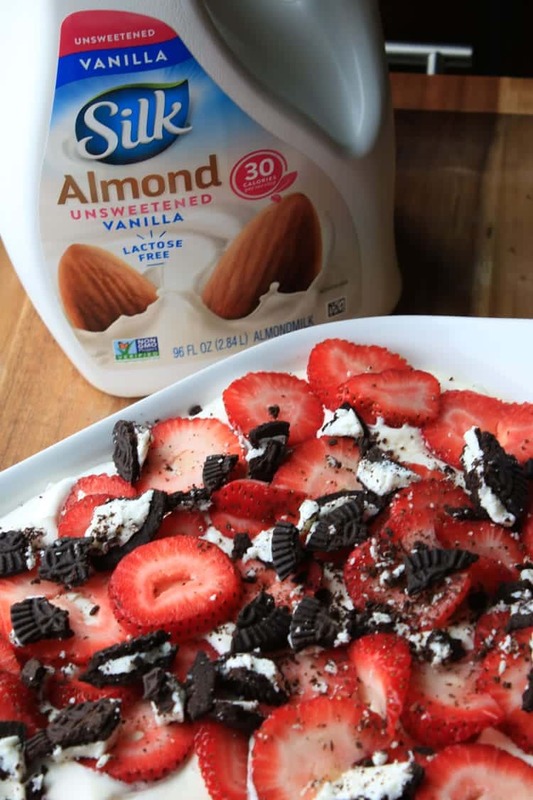 What type of healthier recipes would you make with Silk Almondmilk? Line a casserole dish with low-fat chocolate sandwich cookies, reserving 3-4 cookies to be crumbled up and sprinkled on top of the dessert. Do we freeze after making or serve immediately? You can do either. If you want to serve it frozen, then freeze after making. If you want to serve more as a pudding, then no need to freeze. It’s great either way!